Experience Mongolia's horses, culture and endless beauty on a 10-day riding trek. In a country more than twice the size of Texas but with a population only the size of Houston, one finds open land, peace and serenity. Just over an hour’s drive outside of Mongolia’s capital city, Ulaanbaatar, a piece of paradise awaits discovery from the saddle. The Mongolian horses live in an almost wild state, have an incredibly smooth gait and seemingly endless endurance. 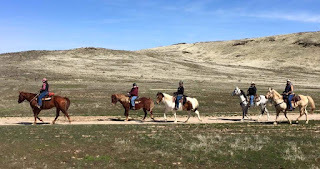 Horses are kept as nature intended, and the herdsmen share a silent connection with them, their unwritten traditions passed down through the generations. On horseback is the perfect way to experience this country. I watch a herd of 40 horses cross the river that runs through the land owned by Baagii and his wife, Saraa. A mare tied to her foal coaxes it across. Instantly falling in love with this country, I would soon discover that the people are as genuine as its beauty. The herdsmen live as nomads, moving their portable round houses, called ger, to greener pastures. The wooden accordion-style sides of the ger fold up, the center columns that support the roof slats all come apart, and topped by the felt or canvas shell it lays neatly on a wagon that is often pulled by a yak. Young children fetch water from the river; women milk mares and ferment the liquid to make the famous beverage called airag. Yogurt, cheeses, curds and other food staples are made from yak, sheep, cow and goats' milk. Cashmere is spun from goat hair. The Mongolians of the countryside live a tough yet peaceful and sustainable life off the land. 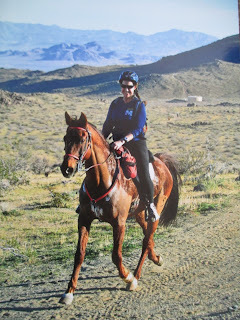 Jill, from Connecticut, and I arrived at Orlando Airport in Florida at roughly the same time on the afternoon of Thursday, March 10th to begin our three-hour journey to the Fun In The Sun (“FITS”) Endurance Ride in Williston, Florida. We rented a little economy car for which both of our large luggage bags just barely fit. Thankfully we were only bringing our riding clothes, hydration packs and riding boots and not saddles, as that little car was jammed packed. We had both leased young horses from a Canadian veterinarian who was living in the area with her stable of endurance Arabians. When we arrived, we were greeted by a very sullen and disappointed horse owner who was pulled from the 100 mile for lameness. We were also advised that the horse Jill had originally leased, Style, was lame and was replaced with Lady. This sudden change in horses caused a bit of bewilderment, as Jill had taken out insurance on Style and had to contact the insurance company at 4:58 p.m. and have the insurance changed. Luckily for Jill, the agent answered the phone and helped her with the changes.